Around 18 months, we decide we should start prepping Ryan for potty training. We buy a potty training potty, and a toilet insert so he can sit on the toilet if he wants, without falling in. All the books, articles, and speaking to friends, tell me some kids like to have their feet on the floor, and some like to sit on the toilet. We start “talking up” potty training. I become almost OCD, asking Ryan if he wants to sit on the potty, every hour. He never wants to. I try harder. I switch him to cloth diapers, so he will start getting used to having a wet feeling, assuming this will all move him in the direction of wanting to use the potty himself. At 24 months, I feel like a complete failure, because Ryan is still not potty trained. More advice from friends and the doctor tell me usually boys aren’t fully potty trained until three or four. I can’t see myself changing diapers for another year, especially since I had Cole on the way in four months. I decide to keep him undressed from the waist down during the days we were at home, in his Baby Legs, assuming this will move him in the direction of wanting to use the potty himself. Cleaned up more pee on the living room floor during this time than I ever thought possible. Watched movies about Elmo, and Joshua (Once Upon A Potty), going to the potty so many times, I lost brain cells. How bad is it when you can’t get the Going to the Potty song out of your head, and you know all the words? At 36 months, operation Potty-Training-Because-I-Am-Going-Nuts-Changing-Two-Sets-of-Diapers-Everyday, was underway. God bless the M&M! I am sorry to every mother I ever judged for using them, because after a year and half of me trying, suggesting, gently reminding, using a sticker chart, toys, movies, books, and anything and everything else, the M&M finally does the trick. It is the key to the toilet for the toddler! Ryan actually wants to go on the potty, and starts doing it himself. God bless the M&M! At 39 months, I have reached toilet training Nirvana! A potty trained toddler! After going through all of that- (and that is the short version), I am in no rush to potty train Cole. He has been interested in the potty for months, watching Ryan very intently when Ryan goes. 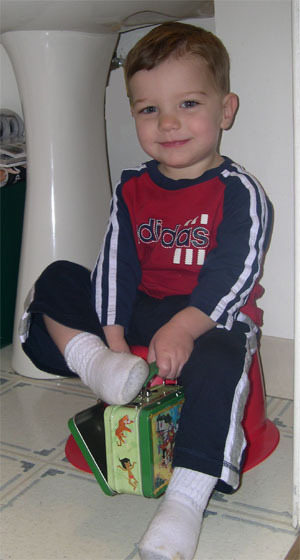 When Cole was about six months old, I came across a Baby Bjorn Potty at a consignment sale that I got for Cole. It was smaller than the potty chair we had for Ryan, and if nothing else, I thought he may like sitting on it when it comes time for him to watch Joshua (it is the same type of potty that Joshua uses in the book and movie). Cole took a liking to it right away, and has often sat on it, sometimes even taking his diaper off. As of lately, he doesn’t like to sit on it without his diaper. When Joe was watching him one afternoon before Christmas, he saw Cole’s cues, and had him sit on it. Cole used the potty. He has done it a few times since, but since we are not training him, it hasn’t been consistent. During the last week, I have noticed that Cole will pull his diaper down, and he’ll be walking around the house with his pants and his diaper to his ankles. One time I tried to pull the diaper back up, but he threw a fit. I noticed then, that the diaper was wet. He doesn’t like the feeling of the wet diaper! (Can I get a Hallelujah?) He has also started coming to get us, the moment he is done pooping. He points to his bum and won’t do anything until we change his diaper! (Can I get another Hallelujah?) Today, after his nap, I was folding laundry and he kept pulling at my hand. I thought he wanted to show me a toy, and I kept telling him in a moment. He was just as insistent and wouldn’t stop pulling on my hand. When he stood up, he had gone potty. I know he’ll eventually figure it out- that he has to take his diaper off, before he sits down, 😉 and so far just leaving him alone has worked out well. It also helps that I am not pregnant, and stressed about getting him trained before a new baby arrives. But what a difference a second child has made. Maybe that is the secret- leave them alone, and they will figure it out. Turns out I didn’t potty train Ryan- he trained me- he trained me to realize that steps and milestones will be made and reached when it is time. Yes, the M&M’s helped, but they were a tool. What I failed to see at the time was, he just wasn’t ready. The M&M’s only worked because Ryan was ready to use the potty on HIS timetable- not mine. Lesson learned. that’s really excellent, keep upp writing.